Dru Hampton considers herself lucky. Abandoned as an infant, she grew up as the dearly loved foster daughter of Marsha and Joe Dixon. When she aged out of the foster care system, Vivian Douglas, town matriarch, gave Dru a place to live and a job at Dream Whip, Vi’s restaurant, “the best burger joint in three counties.” Not only did Vi make it possible for Dru to stay in Chandlerville, Georgia, the suburb of Atlanta that both call home, but she also encouraged Dru to become involved in community service. Vi even provided financial support for Dru’s favorite project, radKIDS, a self-defense program that teaches children coping skills for dangerous situations. When Vi is admitted to the Harmony Grove Hospice Center, Dru does not hesitate to contact Brad Douglas, Vi’s grandson, even though Dru has spent the past seven years avoiding all contact with Brad on his brief visits to Chandlerville. Dru’s debt to Vi is greater than her need to avoid Brad. At eighteen, Bradley Douglas was on a fast track to self-destruction. His grandmother’s tough love was what he needed to make him switch routes, and at twenty-five, Brad is a reformed bad boy, working as a special officer with the Savannah Police Department to serve the city’s most vulnerable. His biggest regret is that he hurt Dru Hampton and played a part in the disappearance of her beloved foster brother (and Brad’s best friend) from Chandlerville. But Dru has consistently rejected all his attempts to apologize, and he has decided the biggest favor he can do her is to respect her wishes and leave her alone. Brad has limited his visits to his grandmother to give Dru space, but with Vi under hospice care, he is determined to be there for the woman to whom he owes everything. Vi Douglas may be dying, but she has enough strength left to manipulate her grandson and her young friend Dru Hampton into dealing with their shared past. They will learn to work together or they will lose the home and business to which Vi has devoted her life. Anna DeStefano takes readers back to Chandlerville, Georgia, in this novella that introduces a new series, Echoes of the Heart, and revisits the setting of her Seasons of the Heart series (Christmas on Mimosa Lane, Three Days on Mimosa Lane, and Love in Mimosa Lane). The characters in Here in My Heart have all the flaws, the warmth, and the complexity of DeStefano’s earlier books. Seven years may seem a long time for Dru to hold on to her anger and hurt, but DeStefano makes believers of her readers by showing them the vulnerability of a sixteen-year-old and making them aware of Dru’s unique circumstances. Brad has all the appeal of a conventional former bad boy plus a generosity and a willingness to risk his heart that set him apart from the type. Both are sympathetic characters who easily capture readers’ hearts. The eccentric Vi, the great-hearted Dixons, and the nosy but compassionate citizens of Chandlerville add dimension to the story. Fans of the earlier series will doubtless be pleased to glimpse some familiar characters, but no prior knowledge is needed to fall in love with the new series. DeStefano makes the foster care system, an issue she has touched on before, a concern in this story as well. She also weaves in issues of internet predators and the importance of empowering kids to deal with the realities of life in the 21st century. Fans of small-town romances, especially those of authors like Robyn Carr, RaeAnne Thayne, and Sherryl Woods who blend the charm of small towns with life as we know it, will find in Anna DeStefano a new name to add to your must-read list. I recommend Here in my Heart, and I have a feeling that come spring, I’ll also be recommending Waiting for Your Love, the story of the missing brother and his ex-girlfriend. Cheers for another reunion story. Readers, do you enjoy a reformed bad boy? 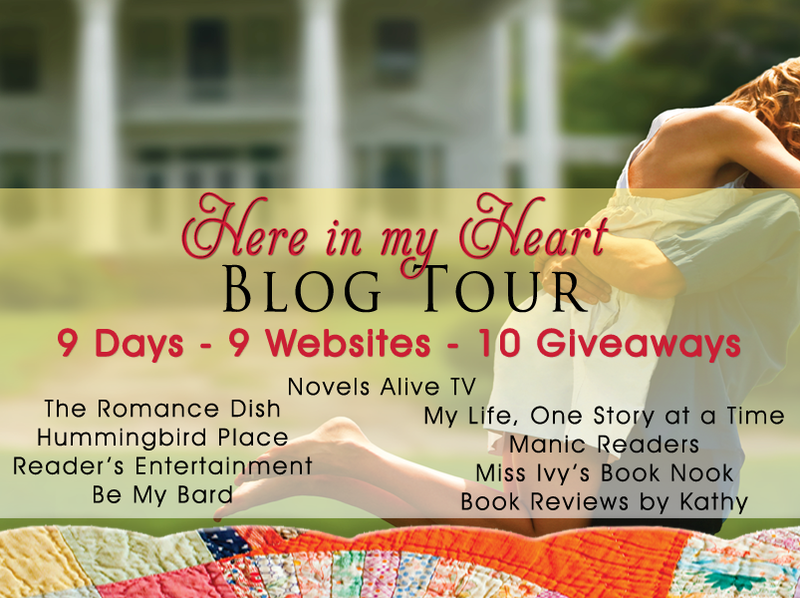 Are you a fan of the small-town contemporary romance? Have you read Anna DeStefano's books yet? Do you like reunion stories? Nationally bestselling author Anna DeStefano has searched her entire life for the soul of the matter at the heart of her world's mysteries. As a small child, she drew from her experiences, senses, and dreams to paint a lush fantasy world, filled with endless possibility and characters of her own creation. Putting pen to paper, Anna transforms these inner landscapes into rich storytelling. Hers is a realistic but optimistic vision, searching for hope and transformation through intense emotional journeys. Her fuel--the inner passions and conflicts of the characters she crafts. Much like a caterpillar transforms into a butterfly, Anna's characters face the ultimate of human choices: finding the courage to conquer their fears and thrive until, despite every obstacle, they become the beautiful things they're meant to be. An author, workshop and keynote speaker, writing coach, and acquiring editor, Anna's creative vision permeates every challenge she undertakes. She wants you to stop, look, and keep digging, until you find the soul of your own fantasies. Her novels' rich blend of realism and fantasy invites Anna's readers into her creative mission to dig deeper and see each of life's moment with emotional honesty and clarity. Discovery and joy are her touchstones, regardless of how difficult her characters' journeys might be. She will challenge you to transform into all you're meant to be, as well. She speaks and blogs regulary. Join Anna each week for Soul Of The Matter, Dream Theories, Things My Teenager Says, How We Write, Waterfall Challenges, and more. Past President of Georgia Romance Writers (GRW), Anna's also Senior Tech Writer with a GA Tech honors degree an 10 years of experience working in Corporate IT. Her novels have garnered numerous awards including twice winning the RT Reviewers' Choice Award, the Holt Medallion, the Golden Heart, the Maggie Award for Excellence, and finalling in awards such as the National Readers' Choice and Book Seller's Best Awards. She's the author of over 16 novels since 2004 in four different genres, with nearly half a million copies of her books in print in over 5 different languages. I love all that you mentioned. And have only read one of Anna's books. This sounds like a very good novel that's guaranteed to pull at the heartstrings. I'm looking forward to reading it. A wonderful feature and great book. I love reunion stories! Thanks so much for the opportunity to win! All yeses - thanks for this review! I love the reformed bad boy... especially when he's only reformed for the heroine and still "bad" to the public :) thanks for sharing! I haven't read any of Anna's books yet, but I'm sure looking forward to doing so! This sounds great! Thanks for visiting. I love all the tropes mentioned. LOL I've read some of Anna's Harlequin books, but I did pre-order HERE IN MY HEART and am looking forward to reading it. Amazing Author and a beautiful quilt! I love her books. I do love small town stories - this looks like the kind of story I love! I have read a few of Anna's books and enjoyed them. Her characters and situations are realistic. The towns they live in, their families and coworkers, the situations they find themselves in aren't far from what many of us have encountered if not lived. I am still looking for the rest of the books in one of her earlier series. I want to get to know the rest of the family better. She usually addresses a contemporary issue, but not in a heavy handed way. It sounds like she does it again with the foster care system. I will be reading HERE IN MY HEART and look forward to the new series.